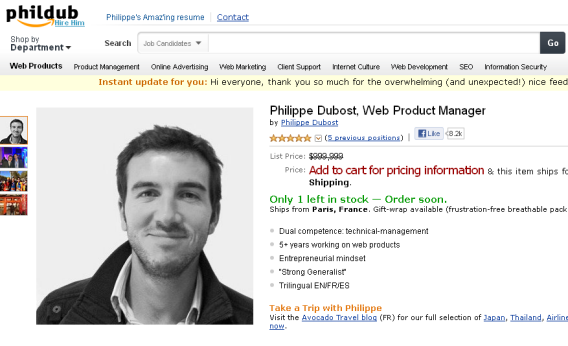 Amaz-ing: Philippe Dubost's fake Amazon page sets new bar for online resumes. There are bad online resumes, there are good online resumes, and then there’s Philippe Dubost’s online resume. Dubost, a web product manager, built a webpage that is a near-perfect ringer for an Amazon.com product page, with himself as the product. You can check out his dimensions (186 centimeters), select language (he’s trilingual), add him to your cart (which brings up a contact form), or even purchase related products like an airline ticket and some Asics (he’s a runner, it seems). And, of course, you can read his customer reviews. They average five stars, of course, but there are a surprising number of one-star ratings—”lots of ex-girlfriends,” Dubost explained via Twitter. The page has gone viral, pushing the limits of Dubost’s server capacity, and he had to fix his contact form after the number of submissions exceeded the cap for his free account with online form-builder Wufoo. Actually, though, I’d say we do have a pretty good idea of how good Dubost is at his job. The guy is a web product manager, and his resume is per se a wildly successful web product. And as his Twitter feed attests, Dubost has been working day and night for the past 36 hours to respond to praise, media requests, and constructive criticism. I look forward to finding out who snaps him up. A screenshot is above, but the full, interactive page is here.